At 27 weeks into her pregnancy with twins, Amber Sylvester went to Mayo Clinic with her husband, Mike, for an ultrasound test and received news that no parent wants to hear. One of the babies was in trouble. She had enlarged kidneys, no amniotic fluid around her body, and fluid in her abdomen. She would likely not survive until birth. Even if she did survive, doctors said she would likely not live long enough to receive a transplant. Remarkably, both babies remained stable, and at 32 weeks, beyond all expectations, they were born via cesarean section. Addie, however, had a collapsed lung and was diagnosed with severe ureteropelvic junction obstruction, a condition characterized by impairment in urinary flow as it travels from the renal pelvis to the bladder. In severe cases, the condition can cause kidney failure. 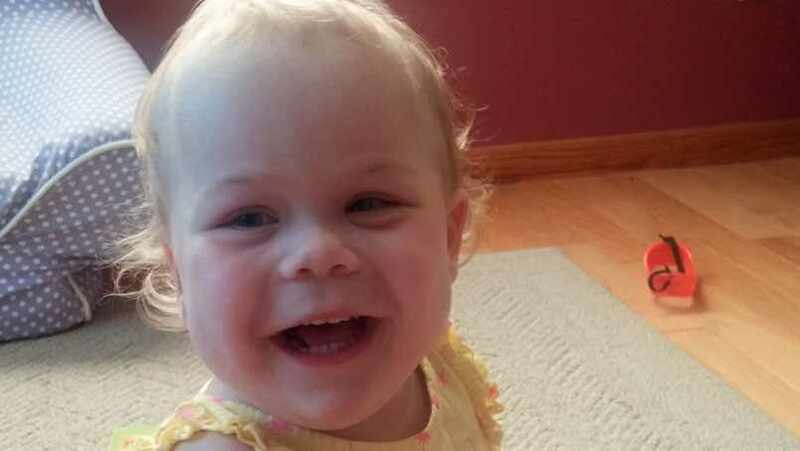 After Addie was born, the family and doctors began to discuss a transplant, but to receive the transplant, she needed to be at least 20 pounds. With multiple feeding issues, including an undiagnosed milk allergy and the ureteropelvic junction obstruction, she was not growing at a normal rate and certainly not gaining weight. In January 2014, Addie finally met the conditions for transplant and began the pre-transplant work-ups at Mayo Clinic Children’s Center. Amber and Mike both wanted to donate a kidney to Addie. In the end, though, it came down to practical considerations. Amber was younger and had fewer health risks, so she would give Addie her kidney. “Most people do not know that an adult can donate a kidney to a small child. With most other organ transplants, size is a serious consideration,” says Mikel Prieto, M.D., surgical director of the kidney and pancreas transplant program at Mayo Clinic’s Rochester campus, and the surgeon who performed Addie’s transplant. After the transplant, Addie improved significantly. Amber says that it was only then that they realized just how sick she had been. “Once we started to see her normalize, we saw how sick she really was and how affected her entire body was,” she says. For a little girl who was not predicted to make it to birth, she truly was a miracle. Addie celebrated her one-year transplant anniversary on June 23. Her one-year check-up was positive, and she has come back with a lot of energy. Now, she is learning how to walk, is working on eating on her own, and is finally getting the chance to bond with her twin brother. Besides being a bit shorter than her twin brother, Dustin, and having a feeding tube, “she’s just a normal 2 ½ year old,” Amber says. In addition to Addie’s determined spirit, Amber acknowledges the doctor who made Addie’s life possible -- Dr. Prieto. Amber hopes that Addie’s story will encourage parents of other transplant candidates and recipients to be hopeful, even in the most challenging circumstances. Learn more about organ donation from the United Network for Organ Sharing or Donate Life America. Explore the Mayo Clinic’s Transplant Center. Check out the Mayo Clinic Children’s Center.